Science & Engineering / Computer Engineering / Information Technology / Electronics & Communications Or MSc(IT)/ M.Sc(Computer Science)/ MCA from Government recognized University or institution. Indian citizen having age in between 23 to 50 years can apply for this City Union Bank Recruitment 2017. 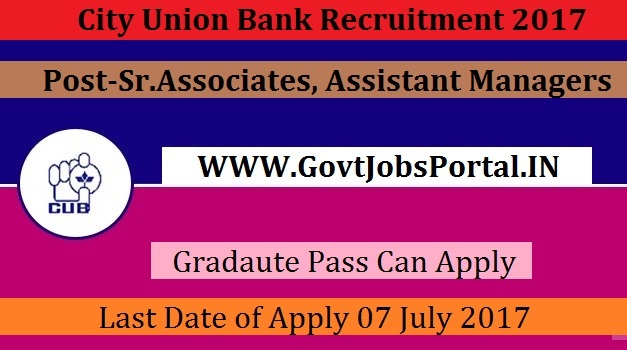 Those who are interested in these City Union Bank jobs in India and meet with the whole eligibility criteria related to these City Union Bank job below in the same post. Read the whole article carefully before applying. Science & Engineering / Computer Engineering / Information Technology / Electronics & Communications Or MSc(IT)/ M.Sc(Computer Science)/ MCA from Government recognized University or institution. Age Criteria: Candidates age limit should to be possess minimum age 23 years & maximum age 50 years.